If only one printer is being used the "Enable printer pooling" checkbox should be unchecked and the appropriate printer selected from the dropdown list. Flip Book Photobooth can share the printing between two or more printers by using the printer pooling option. This will improve the printing speed by sending each new book to be printed to each printer in the pool in turn. Prints won't be sent to printers that are off line so if one printer runs out of paper and is off line new print jobs will be sent to the remaining printers that are online. To add printers to the printer pool, first enable printer pooling then right click on the printer in the list and select "Add to pool". Printers that already in the printer pool can be removed by right clicking on the printer in the list and selecting "Remove from pool". Please note: The print layout routines assume that all printers in the printer pool are of the same type and have the same settings and paper. The examples in this help file use the Mitsubishi CP-D707DW twin deck printer which is a fast dyesub printer capable of printing 6x2 inch strips when loaded with 6x4 inch paper. This is ideal for printing flip books as the printer will do most of the cutting of the pages and save time when assembling the books. When using both decks the Mitsubishi CP-D707DW can print two 28 page books in approximately 86 secs or a single book in approximately 70 secs. The DNP DS40 is also an ideal printer for flip books and can print a 28 page flip book in approximately 70 secs. Other dye sublimation printers also support 6x2 inch printing (e.g. the Shinko S2145, DNP DS-RX1, Hiti P510L, Sony UP-DR200). The Mitsubishi CP-70D printer has very similar settings but doesn't have the option to use the upper or lower printers. Due to limitations in the way the printer drivers work for the CP-D707DW it is necessary to create a duplicate copy of the printer and use printer pooling to make use of both decks. If you try to use one printer and set the "Output place:" to "Auto select" the flip book printing will be shared by both printers and half the pages will be printed by one printer and half by the other printer which makes it difficult to sort the pages into the right order before cutting and binding. This can be avoided by creating a copy of the printer in Windows and using printer pooling as described below. Step 10: Setup the two copies of the printers by right clicking on the entries and selecting "Setup printer". 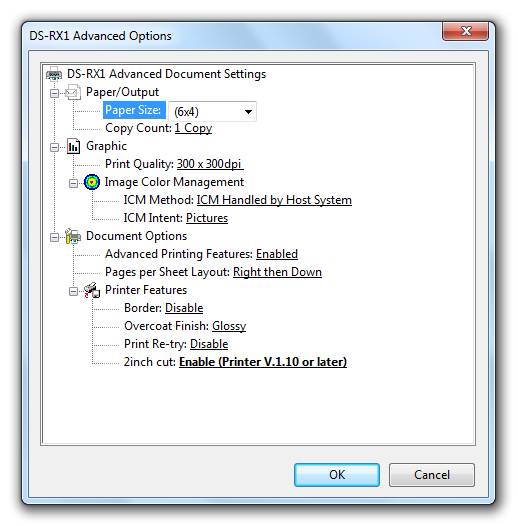 Use identical page settings for the two copies of the printer but set the "Output place:" for one printer to "The upper printer" and set the other to "The lower printer"
Please note that the DNP DS40 has three settings for the print quality: 300 x 300dpi, 300 x 600dpi and 600 x 600dpi. The best setting for flip books is 300 x 300dpi because it gives the fastest printing speed. 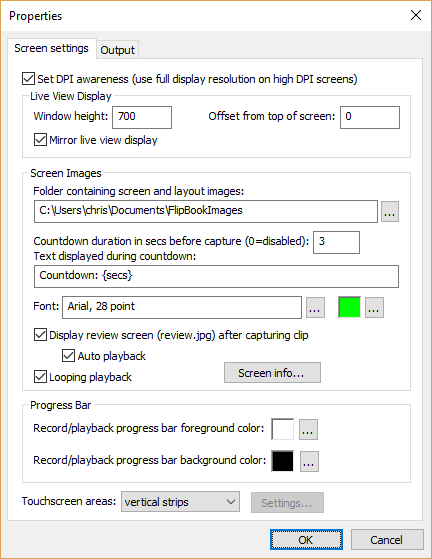 The 300 x 600dpi setting is not suitable because it has different resolutions in the horizontal and vertical directions which will confuse Flip Book Photobooth's print layout. The 600 x 600dpi gives slightly better print quality but requires four times more data to be transferred from the PC than the 300 x 300dpi setting and is significantly slower. Current DS40 printers support 2 inch cuts to print two 6"x2" strips from a 6"x4" page. Older DS40 printers don't support this but can be upgraded (this is a hardware and a firmware upgrade). Please contact your printer supplier or DNP if you have an older DS40 printer that needs upgrading to support 6"x2" printing. For this printer the paper size should be set to 2x6 inch and the ribbon size to 4x6 inch. The laminate pattern should be set to glossy not matte for faster printing.